Useful: Nokia Lumia Momentum Map – keep track of Lumia stats! 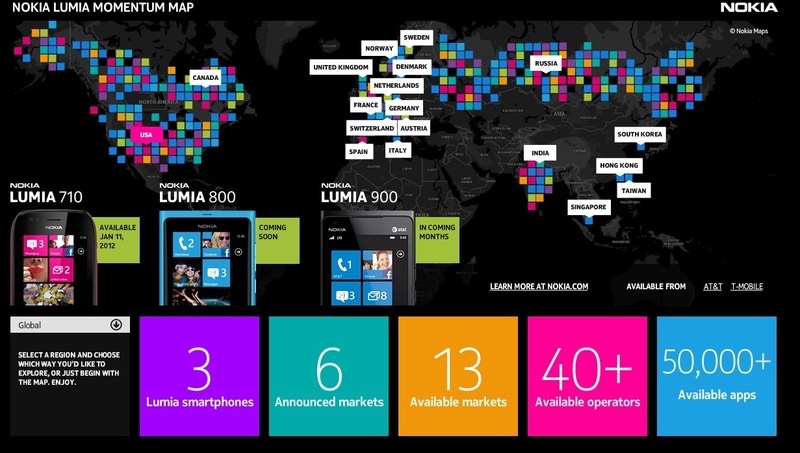 6) Number of Nokia Lumia Smartphones officially available at each country. note USA has Nokia Lumia 800 coming soon. So definitely something to bookmark. And also still only just 13 markets. Even at 6, it was funny for some folk to claim that was the entire Europe market. Note the Nokia Lumia 800 as coming soon. That as we heard early in the morning was going to be sold directly at Microsoft’s stores. « Nokia Store now at 11M daily downloads, Nokia N8 most popular, India downloading more than other top 5 combined.